Recently I heard a criticism of the Occupy the World Movement, complaining that they were selfish and spoiled. The person talking was saying that they should accept the way things are, and not engage in class warfare, because it is un-American. It was obvious that that person got all of their news from MiniTrue. But let’s break this down. Are the Occupy protesters selfish? And a corollary question, is their selfishness wrong? First, are they selfish? The answer to this is yes (probably), at least for a lot of them. They are acting in what would be termed rational self interest, where they are doing something that they hope will have direct benefit to themselves. They hope that by turning the spotlight of scorn and anger on the Masters of the Universe, and by getting the government to recognize that the 1% are a far smaller group than the 99%, they will effect change that will bring back jobs; jobs that they might one day have. Rational self interest is different from enlightened self interest, where you do something that has no overt direct benefit to you as a person. Enlightened self interest is when you act for the betterment of all, with the thought that that improved standard will have indirect benefits to you. Welfare, Food Stamps and Medicaid are examples of enlightened self interest, since only a small percentage of people need those programs, but all of society benefits from them. I’m sure that some protesters are acting from enlightened self interest as well. In either case though, they could be described, in absolute terms, as selfish. But is that selfishness wrong? We can answer this in multiple ways. 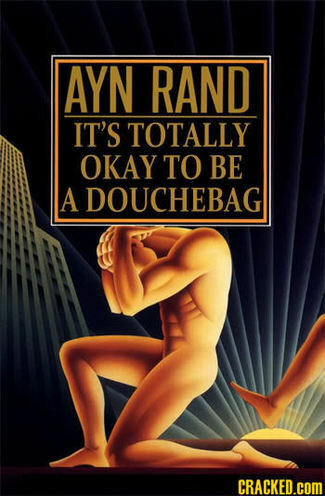 First, let’s look at the Ayn Rand, Objectivist, viewpoint. Ayn Rand was the first to argue that people should work toward rational self interest, that selfishness is a virtue. It should be noted that her definition of selfishness is different from the version we learned in school. She defines it as everyone should pursue what they want to pursue, without regard to the collective of mankind. What other people, especially the existing power structures, want you to do has no impact on your decisions. This is the Howard Roark model of behavior. Next let’s address this from a pure Capitalist point of view. The Free Market has no regulations; the Invisible Hand must have no restrictions. This means that government intervention to stop and sort of response to a corporation is as inappropriate as regulation on the corporation. The Market allows freedom to protest, and the Market, if it wants to continue, must respond to that protest. I had a Free Market Evangelist rant to me about the increase on regulations on the food industry, in the wake of one of those incidents where people across the country got sick from eating contaminated food. He said that it was the consumer’s responsibility to educate themselves, and boycott the dangerous product. In his argument, if enough people refused to buy the product, the company would have to change their ways or go out of business. Either way safety would be protected without any government interference. Occupy Wall Street is a perfect example of that Free Market Boycott. Either Wall Street changes the way they do business, or they fold up and go away. Either way, change is effected, without any government interference. In fact, if the government breaks up the protests, they are interfering with the Invisible Hand and the Free Market. This is not a spin on Free Markets, this is actually what is supposed to happen, by the rules of pure Capitalism. Under this interpretation of the Gospel, people who are tying to get more in life, acting “selfishly” in order to get ahead, are just doing what God wants them to do. If God wants them to be rich, and they are trying to get more people to be prosperous, then how can that selfishness be wrong or sinful? God wants them to do it. So under any of the three viewpoints on the right, the Libertarian, the Free Market or the Evangelical, the Occupy Protesters are selfish, but that selfishness is not wrong. Selfishness in this case is perfectly acceptable, part of the Free Market, and possibly even God’s will. There should be no problem with this movement from a selfish point of view. Or maybe we’re just dealing with a bunch of people who actually want to make the world a better place to pass on to future generations. Maybe, they just want to do the right thing, with no benefit to themselves at all. Maybe, for once, these people are being guided by the angels of our better nature. That would really confuse people.